Spring Training is always an optimistic time in baseball. Fresh off a cold winter, and usually full of fresh faces, it’s easiest to have hope for even the most doomed club. Look at the throngs that travel from Chicago to Mesa, Arizona to HoHoKam Park and swear that this will finally be the year for the Cubbies. Sorry Rachel, I don’t think they’ve got it this year. The Nationals probably don’t either, but you wouldn’t know it to talk to their fans. 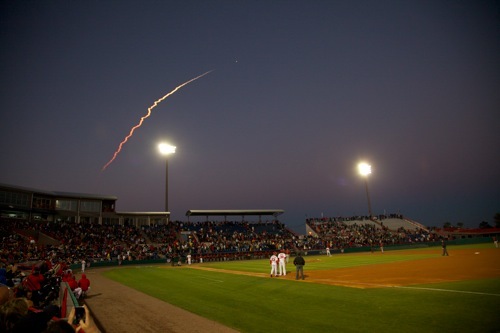 Nationals fans flocked by the hundreds to Space Coast Stadium in Florida this February and March to watch the Nationals take the field with unusual lineup combinations and positions, as they try to figure out what the team will look like come Opening Day on March 31st. The sunny picture in their minds may still be brought down to Earth by May, but for now, these are some happy and optimistic fans. I first spoke with Phil Hendrix from Richmond, Virginia, who came down to Viera with his Dad to take in a few games. The pair were garbed in Nats gear, jerseys and hats, and were clearly enjoying the Saturday sunshine before the game against New York. Hendrix makes trips up several times a year to go to games with his friends at area colleges, and was pleased with the off-season pickups. Hendrix picked the Nationals for 81 wins at least this season, which may be a bit optimistic. Greg Pryor from DC, sporting a Tommy John, 37 shirt in honor of Strasburg was a bit more of a realist. “They were sloppy last [Friday] night,” harping on the team’s perennial difficulties with defensive play. When asked about a .500 prediction like that from Hendrix, “People are naïve,” said Pryor, who was visiting for a few days to get some sunshine. 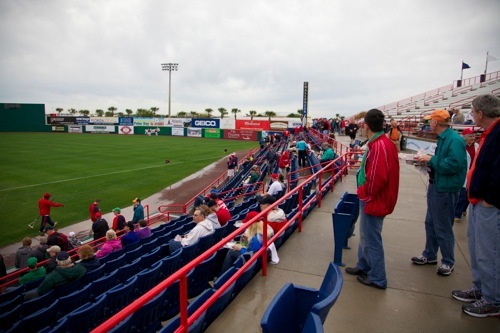 The Pryors bought the full season package for Viera just so they could get into the ballpark during practice ahead of the game, selling the rest of the tickets on the secondary market. “This will be an above .500 team,” said Chris Windham from Warrenton, “but the pitching still scares me.” Windham, and friend John Moore from Fairfax, had come down to Viera to see the Nationals tune up for the season. “A lot hinges on [Jason] Marquis,” said Moore, and whether he returns to earlier form, or starts the season as disasterously as he did in 2010. “If they stay healthy, these guys are going places,” he continued. It’s a tough thing to love an uncertain ballclub, where prospects for a good season seem far off, let alone the playoffs. Many fans find strength in numbers, and in traditions of travel. Shared sacrifice makes it all worthwhile. I remember a conversation last summer with my friend Hal, wherein we lamented yet another losing season for the club, and he spoke at length about the eventual championship (odds are, outside of Chicago, it’ll happen here at some point) being made more sweet by the struggle to get there. 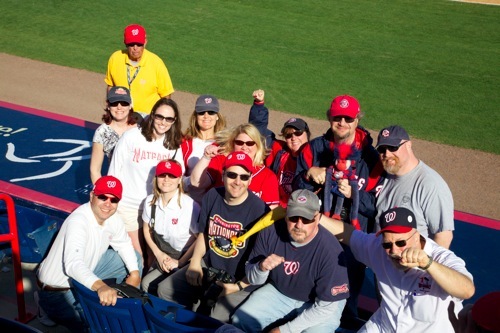 The Nats fans may be more optimistic than those who follow, and write about, the Nationals. The Internet Baseball Writers Association chapter in DC released their best guesses last week, with most of the writers predicting a fourth or fifth place finish in the NL East, and almost everyone put the team’s wins in the mid-70s. But the fan is the heart of the franchise, loving beyond all reason, with rare exception, believing always that a winning streak is just around the corner. Perhaps they’re right, and we’re wrong. In 16 days, the adventure begins for real.